Live the 3D play experience! 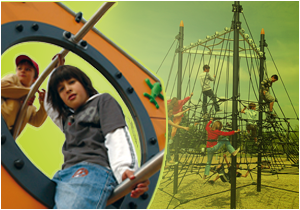 Climbing equipment allows children to test their balance, agility and coordination. It is an essential part of many playgrounds allowing children to gain access to multi play units and it is also a great component on its own. A wide variety of climbing equipment is available including nets, climbing walls, ladders, somersault bars and pyramids; all providing varying levels of difficulty for different age groups and ability levels.